Attention Former Citigroup Preferred Stock holders: I have posted a table on the Preferred Stock Investing Reader's Forum that allows you to calculate the market price that Citi's common stock must reach in order for you to be cash-even on your converted Citi preferred stock shares. To use the table, look down the first column and find the purchase price that you originally paid for your Citi preferred stock. The value in the second column is the market price that Citi's common stock must reach for you to break even. What goes down must come up. 6.6% of the cash that investors have had sitting in money market funds has come back into the market since March. The Last Month's CDx3 Investor Results article below shows you the effect that this re-entrance of investor cash has had on the market price of the highest quality preferred stocks versus the S&P 500 over the same period. 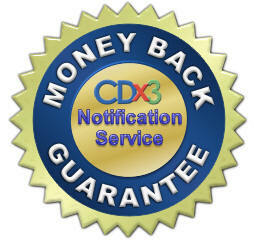 If you subscribe to my CDx3 Notification Service (what's this?) and later change your mind, I am offering a money back guarantee as described in the Special Announcement article. This announcement formalizes a policy that I have had since I started the CDx3 Notification Service several years ago. The features and benefits of the CDx3 Notification Service need to support your investment objectives; if you decide to go a different direction, you're covered. In the CDx3 Company Spotlight article I introduce you to Alliant Energy Corporation. Now 92 years old, Alliant just received approval for a 32,500 acre wind power project. Read about how Mother Nature has cut both ways at Alliant, providing enough wind energy to power 50,000 homes in Alliant's service area while devastating its customers, employees and corporate headquarters when Cedar Rapids, Iowa flooded last year. 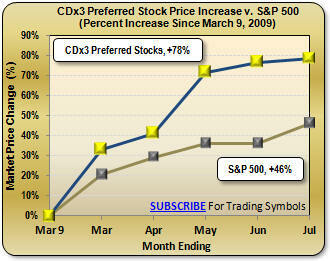 The CDx3 Question of the Month is presented both here and on the Preferred Stock Investing Reader's Forum. If you visit the Forum you can test your knowledge by clicking on your answer to the question. You will receive an automatic email that provides you with the correct answer and my explanation. Or you can just read the answer in the below CDx3 Question of the Month article. This month, I answer the question "which of these CDx3 Preferred Stocks provides the best overall annual return?" Coming Up For Preferred Stock Investors: The Market for the highest quality preferred stocks may have reached a major milestone during the first week of August, just as I am sending this issue of the CDx3 Newsletter to you; a milestone that has alluded us for two years now. 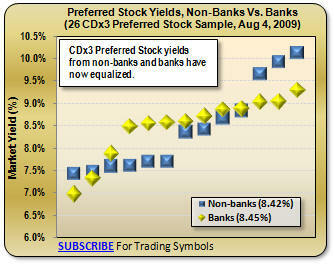 During the first week of August The Market priced CDx3 Preferred Stocks issued by banks, and those issued by non-banks, such that their average yield is at the same level - 8.4%, as illustrated by the chart that I present at the bottom of this CDx3 Newsletter. Does this mean that The Market is no longer assigning additional investment risk to bank-issued preferred stocks? The financial press is reporting that cash is coming out of money market accounts and back into the market by the bucket. After reaching a near 20-year high in March, money market accounts have shrunk by 6.6% (source: Bloomberg, July 23, 2009). Since it bottomed out on March 9, 2009 the S&P 500 stock market index has recovered nicely - up 46% - so I think we can conclude that the financial press has probably got it right. But a closer analysis shows where the action really is. I went back to March 9, 2009 and calculated the average market price of CDx3 Preferred Stocks on that day then made the same calculation for the end of each month through the end of July. Since the beginning of this year I have made the point that during economic recoveries the market will tend to recover first since investors are motivated to get in early. And the market recovery tends to start with the highest quality, lowest risk bonds and preferred stocks. As welcome as the 46% increase by the S&P 500 index has been, the average market price for the highest quality preferred stocks ("CDx3 Preferred Stocks") has increased an astounding 78% since March 9, 2009. While the cash coming out of money market accounts since March is, in fact, going back into the stock market, this recovery, like many before it, is starting with the lower risk alternatives first - CDx3 Preferred Stocks. Based on what is starting to be a pretty high pile of positive indicators, most economists and analysts are starting to agree that the economy, while still having a long way to go, has turned the corner toward recovery. The massive amounts of cash coming out of savings and into low risk investments is certainly consistent with this view. But seeing this type of recovery in living color (see chart at right) leads directly to the next question: is there still enough upside to take advantage of the recovery or are you too late? Without being clairvoyant, no one knows the answer to that question for sure. But consider the following calculation (I presented this calculation for just bank-issued CDx3 Preferred Stocks in the May issue of the CDx3 Newsletter; here it is for CDx3 Preferred Stocks overall). As a group, these CDx3 Preferred Stocks have an average declared annual dividend rate of 7.41% and their current (July 31, 2009) average market price is $19.91 (that’s an average annual dividend yield of 9.03% for this group). So if you were to purchase this group today, you would pay $19.91 per share on average. As the economy recovers over the next couple of years, declared dividend rates being offered by new CDx3 Preferred Stock issues will fall off of their current historically high 9.17% average toward a more normal 7% or so. Remember that new CDx3 Preferred Stocks are always introduced at a market price of $25 per share. In other words, as dividend rates fall back to a more normal 7%, this group will yield 7% when its average market price rises to $26.46 per share. Today, you can buy a share of this group for an average market price of $19.91 per share. Buying now for $19.91 and selling downstream for $26.46 delivers a $6.55 per share (potentially another 33%) capital gain to you for this group of CDx3 Preferred Stocks. How do you position yourself to take advantage of it? 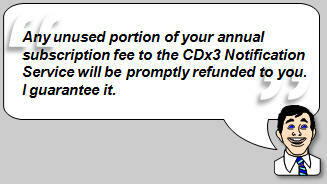 Subscribers to the CDx3 Notification Service receive their own monthly newsletter called CDx3 Research Notes. Along with the results of my ongoing preferred stock research, each month's issue identifies the trading symbols for CDx3 Preferred Stocks that, research shows (Preferred Stock Investing, chapter 10), are at a point in time that tends to most favor buyers. To ride the recovery wave with the highest quality preferred stocks, you should consider subscribing to the CDx3 Notification Service. We do all of the research and calculations for you and you receive an email message when there is a buying or selling opportunity coming up for the highest quality preferred stocks. "You are entitled to a prorated refund of the subscription fee, equal to the unused months prior to your expiration date times the calculated monthly subscription amount which is the subscription fee divided by twelve (12), should you choose to cancel your subscription. You can cancel your subscription at any time by sending an email message declaring your cancelation to [Customer Support]." Alliant Energy Corporation was founded in 1917 and is the $2.9 billion parent company of Interstate Power and Light Company (IPL) and Wisconsin Power and Light Company (WPL). Through these two subsidiaries Alliant's 5,318 employees provide electric and gas utility services to more than 1.4 million customers throughout Iowa, Minnesota and Wisconsin. Following on the heals of the December 2008 launch of its 68 megawatt Cedar Ridge Wind Farm, on July 9, 2009 Wisconsin regulators approved Alliant's second wind project, the Bent Tree Wind Farm. The Bent Tree project will be built on a 32,500 acre parcel and generate 200 megawatts of wind energy, enough to power 50,000 homes. To read more about Alliant's Bent Tree Wind Farm click here. But for most utilities, including Alliant, Mother Nature plays both sides. Just as the winds of Wisconsin provide a clean energy opportunity, floodwaters in June 2008 took out Wisconsin's Lake Delton, emptying the entire lake, all at once, into the Wisconsin River. Rapid City, Iowa was quickly covered by nine square miles of water - equal to 1,300 city blocks. Miles of Alliant's electrical lines and natural gas connections were suddenly useless. On March 11, 2009 Alliant was presented with the Edison Electric Institute's (EEI) 2008 Emergency Recovery Award. In presenting the award EEI's President, Thomas R. Kuhn, said "IPL did not miss one beat in restoring power to its customers, even after losing their corporate facility to the devastating flood." Alliant Energy Corporation is an issuer of CDx3 Preferred Stock. Which of these CDx3 Preferred Stocks provides the best overall annual return? 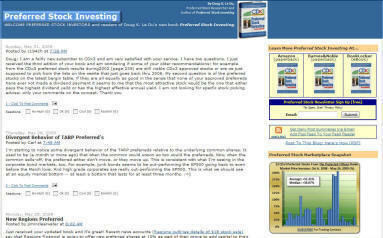 - Preferred Stock Investing Reader's Forum. The preferred stock research presented in my book, Preferred Stock Investing, identifies when the market price of the highest quality preferred stocks is likely to favor buyers and, later, sellers. Using the method described throughout Preferred Stock Investing, CDx3 Investors use the highest quality preferred stocks to earn above average dividend income while simultaneously creating multiple downstream capital gain opportunities. When making a buy or sell decision, investors naturally want to have some idea, given the market prices at the time, of the rate of return that they might realize. It sounds like a straightforward enough question and it is - once we get some clarification. But before I dive into this question, I have posted this CDx3 Question Of The Month on the Preferred Stock Investing Reader's Forum (the Forum is free to you, no password required) for you to look over. When you click on your answer to the question (multiple choice), you will receive an automatic email message that provides you with the correct answer and my write-up explaining the answer. If you want to test your knowledge about preferred stocks and investing in them, go to the Preferred Stock Investing Reader's Forum and scroll down on the right side to the feature "Surveys, Questions - Test Your Knowledge." There, you will see this month's question. Just click on the question to test your knowledge. Here is the answer to the question "Which of these CDx3 Preferred Stocks provides the best overall annual return?" (a) Preferred Stock A: 8.0% declared dividend rate, purchased for $24 per share at IPO. (b) Preferred Stock B: 8.0% declared dividend rate, purchased for $24 per share one year after IPO. (c) Preferred Stock C: 8.0% declared dividend rate, purchased for $24 per share two years after IPO. To make this easier to follow I have made these three CDx3 Preferred Stocks identical except for the point in time when you make your purchase. The declared dividend rate of all three is the same (8%) as is your purchase price ($24 per share). To further simplify things, let's assume that the issuing company calls the preferred stock on its call date five years after its IPO (for $25 per share as is most common). Here's why: When determining the annual return of a preferred stock investment there are really two considerations - (1) the dividend "yield" and (2) the overall effective annual return (EAR), which is really the point of this question. Substituting our values: (8.0% x $25) divided by $24 equals a dividend yield of 8.33% for all three of our alternative preferred stocks. Now let's move on to the overall annual return, which is really what we're after. Notice that we own Preferred Stock A for five years and, therefore, collect five years worth of dividend income before the call. With Preferred Stock B, however, we only collect four years worth of dividend income. And, since we purchase Preferred Stock C two years after IPO, we only earn three years worth of dividend income with that alternative. It is tempting to think that, because we own Preferred Stock A longer (having purchased it when it was first introduced) and collect more dividend income, we must earn the highest effective annual return with A. While it is true that your dividend income is greater with Preferred Stock A than with B or C, the effective annual return calculation considers something called the "time value of money." The time value of money accounts for the length of time that it takes to earn the income generated by an investment; the faster, the better. With Preferred Stock C, you make less dividend income (since you only own it for three years rather than five), but the dividend income that you do earn (three years worth) is made in a much shorter period of time, boosting your effective annual return. All other things being equal, due to the time value of money, your effective annual return is higher when you make your dividends in a shorter period of time rather than having earnings stretched out over a longer period of time. This simple example illustrates the importance of "running the numbers" before you invest. Each month, subscribers to the CDx3 Notification Service receive a list of CDx3 Preferred Stocks that, research shows, are at a point in time that tends to favor buyers. And both the yield and effective annual return values are calculated and presented for each CDx3 Preferred Stock. We do the research and calculations, you make the decisions. The CDx3 Special Report titled "Calculating Your Rate of Return" is free to CDx3 Newsletter readers (download PDF) and provides a step-by-step example of how the EAR calculation is made for preferred stock investments (the Microsoft Excel cell formulas are also provided). The 25-month long Global Credit Crisis has shaken our financial system and everyone who is invested in it (which is just about everyone). Even though the CDx3 Selection Criteria, day after day, have successfully filtered out the preferred stocks from every failed bank for over two years now, and even though there has not been so much as a missed dividend for those who have invested in CDx3 Preferred Stocks, there's still some anxiety. Has A Fearful Market Finally Exhaled? For the better part of two years now The Market has viewed banks, and everything connected to them, with a skeptical eye. Since June 2007, as perceived investment risk climbed, market prices fell pushing the yields for many bank-issued preferred stocks above 15% and some even higher. The market prices of preferred stocks issued by non-banks were hurt too, but nothing like those from banks. As illustrated by the chart accompanying the Last Month's CDx3 Investor Results article at the top of this CDx3 Newsletter, the market prices of CDx3 Preferred Stocks have gone back up, including those issued by banks, lowering their yields accordingly. And during the first week of August, for the first time in many months, the yield being offered by CDx3 Preferred Stocks issued by non-banks and that from those issued by banks, reached parity. The Market is no longer making a risk distinction between CDx3 Preferred Stocks issued by banks and those issued by non-banks. The Market is now pricing the preferred stocks offered by both groups at 8.4%. Temporary exception or another sign that the worst is behind us?